There are few topics of worldwide affairs which are more controversial than the Israeli-Palestinian conflict, and director Julian Schnabel is not entirely fearless in his approach to the material. He seems aware of the trouble with impartiality, but makes the film about a single character as a result. This title character, Miral (Freida Pinto), is witness to the brutal treatment of the Palestinian people, allowing for the film to have a message that never seems entirely preachy. There are moments where it pushes the boundaries some and one could argue that it is a one-sided film, but Schnabel always pulls back with acute restraint. 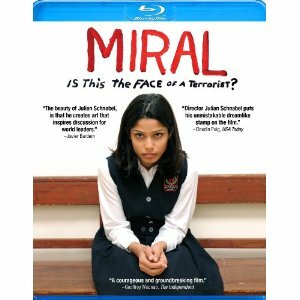 Based on the semi-autobiographical novel, Miral follows the young Palestinian girl as she grows up in a world where the Arab and Israeli people are at constant war with each other. After the young girl tragically loses her mother, Miral is sent by her father (Alexander Siddig) to an orphanage run by a woman named Hind Husseini (Hiam Abbass). This school teaches peace and helps the social aware Miral in her decisions as she leaves the school and discovers the war-torn world she lives in. Miral becomes entangled with the revolutionary types, even romantically involved at one point, but this only makes her life more difficult. She finds herself friends with an Israeli girl, learns more about tolerance than most, and is also witness to horrifying atrocities. The Blu-ray includes a few deleted scenes as well as a making-of featurette. There is also a studio tour by Schnabel, showing off his sets, and footage from a filmmaker Q&A, but the highlight is the commentary track with Schnabel and producer Jon Kilik.